What new remains to be said about David Garrick? As Emily Hodgson Anderson observes at the outset of this by turns fascinating, diverting, and provoking book, his career (both as a performer and pioneering bardolator) and its legacy have been exhaustively discussed. Thomas Davies's Memoirs appeared within a year of Garrick's celebrity funeral in 1779, an event which itself attracted thousands of spectators to witness the passage of the cortège from the actor's home in Adelphi Terrace to Westminster Abbey. In its wake have appeared both popular biographies (most recently, Ian McIntyre's gargantuan bestseller Garrick) and the large body of scholarship that has addressed what used to be termed "the age of Garrick." Anderson's theme, beginning with Garrick, is "the dynamic of desire and loss embedded in all acts of performance" (2), a topic previously explored by, most influentially, Joseph Roach and Peggy Phelan. Anderson's particular point of departure is Garrick's obsessive determination to become a histrionic living monument to Shakespeare and, simultaneously. to make Shakespeare a permanent commemoration of himself. Garrick's preoccupations were shared by his contemporaries and successors: after examining his self-fashioning debut as Richard III in 1741 and his failure to master Othello, Anderson probes the peculiarities of Laurence Sterne's relationship with his--and Shakespeare's-- Hamlet; Garrick's Florizel and Perdita, his adaptation of The Winter's Tale, and its showcasing of Mary Robinson and Sarah Siddons (whose Lady in Macbeth is also considered at some length); Charles Macklin's Shylock and Kitty Clive's Portia; Garrick's 1756 retirement season; and Siddons's post-retirement staged readings. time in the theater does not move in a strictly linear fashion, complicating the very notion of an exit, and making the end of a performance often hard to track. This fact in turn revises how we think about the relationship of performance to loss. If endings need not be permanent, then the performer need never truly disappear...[T]heatrical time is simultaneously cyclical and futuristic, with the same actor enjoying (he hopes) the experience of entering and exiting and entering again. Loss in this experience becomes transient -- the invitation for an actor or a performance to live again (14). In its most developed forms, Garrick's performative memorializing of Shakespeare became "that which could bring the dead back to life, to live next to, and not through, the successors who otherwise stand in for them" (15). This reading of Garrick, Anderson avers, offers nothing less than "a new way of thinking about theater and theater history: not in linear, chronological terms," but (citing an anonymous pre-publication reader of her monograph) as "a network of signification that moves across time." Actors, she writes, are "emblems of vitality who broker an experience that can transcend loss and time" (17). These are bold and intriguing claims, and the study delivers on them when it casts new light on familiar topics. Though the triumph of Garrick's aforementioned "debut" as Richard III played a crucial part in his self-mythologizing, Anderson sets that performance against his struggle with Othello, which is in turn compared with Aphra Behn's Oroonoko as dramatized by Thomas Southerne. For Garrick, Anderson writes, "success in Richard III and then in subsequent Shakespearean plays and roles...depended on a growing investment in merging with his character, en route to his larger project of styling himself as Shakespeare brought to life: not as a substitute for, but a revival of the man himself." Performing in blackface, on the other hand, "demand[ed] that the actor always and obviously be recognized as the imperfect surrogate for a black body that isn't there," attempting (and failing) to create "an illusion of verisimilitude that Garrick was hoping to transcend" (52-3). Here and elsewhere, Anderson's rethinking of the historical evidence is fresh and persuasive. But I was less convinced by her sustained attempts, here and throughout, to render theater history in terms of Shakespearean themes and narratives, though she is, of course, hardly the first chronicler of Shakespearean performance (myself included) to do so. To explain Garrick's performances of Richard III and Othello, she explicates both Othello and Oroonoko, stressing their investment "in issues surrounding memorialization: who is worthy of being remembered, and how these memories can be preserved" (31). To sum up her argument here, she claims that Garrick's project "attempts to do for Shakespeare what Othello's observers, for all of Othello's aspirations, never can: to bring Shakespeare back into the present moment and to speak for him in his own persona. Or, as Othello would say, to 'speak of me as I am' "(54). Though this is resonant, stylish, and neat, I wonder if it is just too neat, with the messiness and contingency of history reduced (or, if you prefer, enlarged) to serve a satisfying Shakespearean pattern. Anderson weaves a similar pattern in her chapter on Charles Macklin's Shylock and Catherine (Kitty) Clive's Portia: for the former, she says, "[t]he story of how Charles Macklin came to play Shylock is a story of debt" (117); for the latter, "in going head to head with Macklin's Shylock she proves herself to be as powerful, and as strategic about her power, as the character of Portia that she represents" (125). Quoting these remarks out of context is perhaps unfair, for Garrick, Macklin, Clive and others would have been well aware of (and actively played upon) the Shakespearean dimensions of the theatrical and real-life scenarios they inhabited. More troublingly, when linking Sterne's obsession with Hamlet to the agonizing circumstances of Garrick's death, Anderson notes the writer's morbid wish to bequeath his skull to the theater profession so that it could posthumously act as Yorick. She also tells us what the autopsy of Garrick's corpse revealed: he was not, as had been suspected, suffering from a kidney stone, but rather lacked his right kidney ("on moving the peritoneum covering the kidneys, the coats of the left only remained, as a cyst full of puss, and not a vestige for the right could be found"). She concludes that "[i]f Sterne's skull represents a surviving physical artefact that his audiences can appropriate at will, Garrick's missing kidney becomes in another sense emblematic" (79). However apt the metaphor, or emblem, the subject of this witticism is a man dying in gross indignity and extreme pain. Even an apt metaphor can sometimes operate in questionable taste. Fortunately, it is not representative of the book as a whole. I was particularly engaged by the section on Siddons's half-public, half-private negotiation of the indeterminate relationship between performing and reading Shakespeare in the years after her retirement from the stage. Anderson brings these events vividly to life. At the Argyll Rooms, she writes, "fitted up in a style of great magnificence, complete with Corinthian pillars and gilt lamps, Siddons read in front of the orchestra, at the far end of the grand saloon, an oblong room containing three tiers of boxes, draped in scarlet, and illuminated by chandeliers" (152). Anderson cogently argues that these readings are more significant than has been previously recognized. Besides creating a physical and cultural space beyond the theater in which the aging Siddons could subtly confront the industry's gender norms, they also redefine the boundaries of what constitutes performance itself. Audiences came to hear Siddons perform all the parts of Hamlet, and she reportedly excelled as Polonius, Ophelia, and the prince. More than that, Anderson says, she became "free, in the process, to stimulate a new type of imaginative freedom among those who attended" (155). 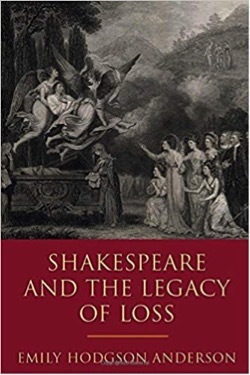 In a deft move, Anderson traces the theatrical legacy of loss beyond the eighteenth century into the nineteenth, and in so doing unsettles the long-established opposition between the Shakespearean stage and the Romantic closet: rather than being opposed to or dismissive of performance, she concludes, Hazlitt and company were "in mourning" for it (157). This, she writes, was Garrick's "final legacy": "what Garrick and Siddons had done for Shakespeare through performance, Hazlitt could now, in the interstices of his imagination, do for them" (161). As this eloquent and nuanced study of loss richly demonstrates, there is much to be gained from doing so. Robert Shaughnessy is Professor of Theatre at Guildford School of Acting, University of Surrey. His most recent books are Shakespeare in Performance: As You Like It (Manchester University Press, 2018) and Shakespeare in the Theatre: The National Theatre, 1962-1975: Olivier and Hall (Arden Shakespeare, 2018). His About Shakespeare: Bodies, Spaces, and Texts is forthcoming from Cambridge University Press. Leave a comment on Robert Shaughnessy's review.